May 2017 • SMT Magazine 35 all records may be equally valid, with logical deletion being a common part of such formats. Changing, adding, or deleting records within the file is extremely likely to create corruption in the system as dependent links are not estab- lished correctly, or are broken. In the early days of manufacturing and engi- neering systems in general, certain files, wheth- er from solution providers or machine vendors, were shared with customers based on their de- mand. While this did make systems more flexi- ble for the customer resolving immediate issues, it brought the risk that the operation could be- come unstable, as customers occasionally made mistakes with the reading, creation, or update of the files, causing data integrity issues, which lead to many bizarre and often urgent support issues, for which the system supplier faced ad- ditional support costs. This is one of the prime reasons that machine vendors and software pro- viders usually charge for official supported in- terfaces, which have defined scopes and limi- tations. This is a technology issue, and also a business issue. No software supplier can accept changes introduced that may break the system which are not under their control. In the light of the new IoT philosophies that are rapidly becoming the expectation, this problem of flexibility versus risk is resolved on the lower level, as IoT establishes the transfer and availability of data everywhere without the need for hacking into internal system database structures. This is a very good thing, as systems themselves can become more managed and se- cure. On higher levels however, risk can be ex- panded by at least an order of magnitude. The introduction of IoT technology is regarded by most already as a given, the only questions are how and when. Expected issues therefore need to be dealt with, two of which are: 1. Extent of IoT data exchange: If we pursue the course of the past in terms of data sharing, IoT data would be made up from sim- ple messages, mainly as outputs, that would re- place the vast array of made-to-order customer interfaces of all kinds that currently exist. Hard- ly a technical issue and it makes business sense, as long as a reasonable data standard definition, such as OML (Open Manufacturing Language) is used. The lesson learned, however from the past, is that information requirements from dif- ferent customers in different situations varies considerably, and, it evolves. Looking at just one set of requirements, even for a major connect- ed application, is not likely to reflect even a sig- nificant portion of the ultimate IoT data needs. 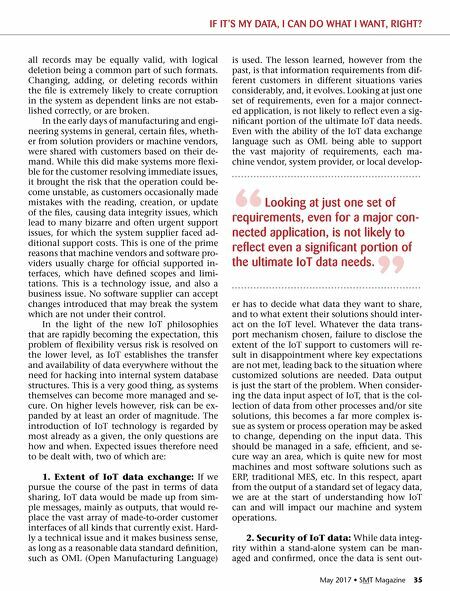 Even with the ability of the IoT data exchange language such as OML being able to support the vast majority of requirements, each ma- chine vendor, system provider, or local develop- er has to decide what data they want to share, and to what extent their solutions should inter- act on the IoT level. Whatever the data trans- port mechanism chosen, failure to disclose the extent of the IoT support to customers will re- sult in disappointment where key expectations are not met, leading back to the situation where customized solutions are needed. Data output is just the start of the problem. 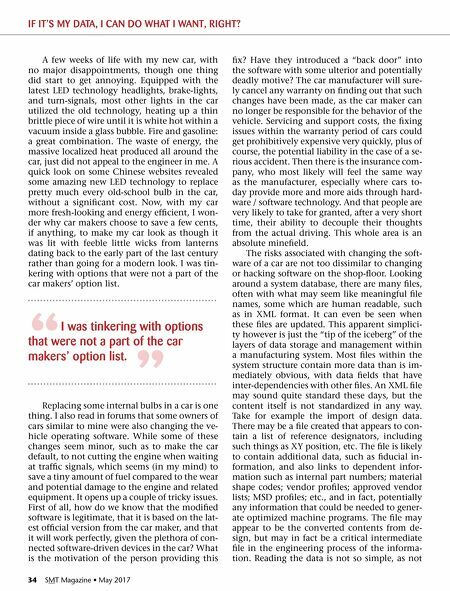 When consider- ing the data input aspect of IoT, that is the col- lection of data from other processes and/or site solutions, this becomes a far more complex is- sue as system or process operation may be asked to change, depending on the input data. This should be managed in a safe, efficient, and se- cure way an area, which is quite new for most machines and most software solutions such as ERP, traditional MES, etc. In this respect, apart from the output of a standard set of legacy data, we are at the start of understanding how IoT can and will impact our machine and system operations. 2. Security of IoT data: While data integ- rity within a stand-alone system can be man- aged and confirmed, once the data is sent out- IF IT'S MY DATA, I CAN DO WHAT I WANT, RIGHT? " Looking at just one set of requirements, even for a major con- nected application, is not likely to reflect even a significant portion of the ultimate IoT data needs. "